I have always been one of those people that touches things. Even when I am not supposed to. I remember being in stores when I was little and getting told ” Don’t Touch THAT!” so many times. I would just find something shiny or pretty or textured and want to touch it regardless of how fragile it was or what the price is and with no consideration of how clumsy I am. So, it’s only natural that I think paintings and mixed media projects with a lot of texture and dimension are even more awesome than their two dimensional siblings. That being said, not only do we offer our own Texture Tools, but we also carry Ranger’s Texture Tools and all of their Texture Pastes. Prima Marketing also has some great products for texture. I’ll run through each of these really quickly. In my last blog post I shared our new Texture Tools. These are not a replacement or competition to Ranger’s Texture Tools though because the textures are almost completely different. Having both sets would give you even more texture options. 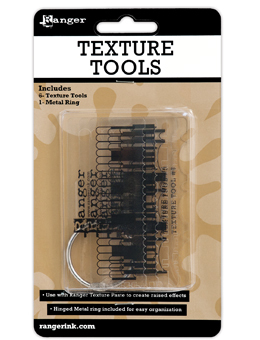 Ranger’s Texture Tools come in a 6 pack with a removable ring for storage. These texture tools have texture on the long edge and one of the shorter edges. They have a print of the design on them for easy reference. They are made of a durable flexible clear plastic , very similar to the plastic we used on our Texture Tools. Drag the tools through mediums that can hold peaks and keep their form such as Ranger’s Texture Pastes. Ranger’s texture tools retail for $7.00. Ranger has three different Texture Pastes to choose from. They each come in a 3.9 ounce jar and retail for $7.50. Click on any of the pictures below to purchase from Simon Says Stamp. The first is an opaque texture paste that will cover any imagery underneath it. This is their original texture paste. Acrylic paint and inks can be mixed into the texture paste to make a solid color. One of my most favorite techniques for using the texture paste is applying it through a stencil with a palette knife. After the paste is dry, you can also stamp on it or paint over it. Ranger states that these texture pastes are artist quality. Then, Ranger came out with Transparent Texture Pastes. This picture above is Transparent Matte. Transparent texture pastes are great for adding texture without covering up the layer underneath. You can also tint these with inks to get a transparent colored texture. This one dries clear with a matte finish. This is probably the one that I am most excited about! While there are times that I don’t want any gloss, most of the time I am using my Luster Mica Powders or Luster Mica Spray Mists and I want a TON of shimmer on my project. You can mix Luster Mica Powder in this for sparkly dimension! Of course, you can mix mica powder in all of the other ones too, but it shows up the best and sparkles the best when it’s in a gloss. Prima Marketing has a pretty cool paste as well! Prima Marketing’s Light Paste is from Finnabair’s Art Basics Line. I have to tell you that I am IN LOVE with everything Finnabair has come up with for Prima so far. It’s right down my alley. Light Paste holds its dimension, so it’s another great option for use with stencils and texture tools. The difference is that it is light and airy feeling. You can add a lot of dimension without added weight. It is opaque and dries white with a tiny bit of transparency to it. A major bonus is that you can dry it with a heat tool! However, I noticed some shrinkage that may have been attributed to drying it this way. I have not tried air drying it though, so I can not be sure. Most of the time in art shrinkage is not a problem since we are not dealing in “exacts”. Light Paste can also be used as an adhesive, but for economical reasons I would stick to using it for dimension. Art Basics Light Paste can also be mixed with acrylic paints to achieve a white-washed dimensional paste. Another great characteristic of Light Paste is that it is bendable! You can put it on projects that have movement and not worry about cracking. You get 8 fluid ounces in a jar for an MSRP of $13.00. That’s still a great price when you consider what a large amount you are getting. This paste is unlike any others I have tried and is worth a purchase to have in your craft arsenal! I hope this blog post has been informational and helped you decide which texture product is right for you. If you have any questions, just post a comment or e-mail intoxicatingarts@gmail.com. Thank you for stopping by! Art Impressions is now at Intoxicating Arts! I’m so excited to announce that Intoxicating Arts now carries Art Impressions stamps! These fun stamps are a great way to add some laughter to your cards. Art Impressions is well known for their Girlfriends series. They also have “shake your booty” stamps which are made specifically for use with action wobbles. Another fun series they offer is the “Try-Folds” stamps. These stamps are made for use with tri-fold cards. As you un-fold the card, the story that the stamps made comes to life! Have you been looking for the perfect stamp for someone who has a birthday coming up and they are not looking forward to it? Art Impressions stamps turn the dreaded birthday and the thought of turning yet another year older into a comical occasion. Click here to browse our inventory! We always have the lowest prices. Flat rate $5.00 shipping on orders over $40.00 on anything in our store! Here’s some of the sets we have in stock right now. Aren’t these stamps just so fun?! These images are just a little peek into all of the great stamps we have in stock right now! Thank you for checking it out and have a wonderful Friday! I have new Graphic 45 and Tim Holtz items up for sale on E-Bay. I wish I could have them for sale in my store, but I do not get enough traffic that way. 😦 . One of these days I will be able to. Anyways, I am almost sold out of the Graphic 45 stuff, so I just placed an order for more. Yay! Here’s a link to everything I have for sale on E-bay: E-Bay Items for sale. AND There’s plenty more!! Thanks for stopping by . Washi Tape Purchasing Secret- Do the Math! I have to admit that I have fallen prey to the Washi Tape sensation. I don’t normally like following trends, but this stuff is so awesome. It actually allows tape to be pretty! I have bought Washi Tape from a couple different sources lately and I want to share with you my findings. If you have not used washi tape before, it is decorative tape that is a paper type of tape which rips off the roll easily. It is not very sticky and can be repositioned easily. Washi Tape originated in Japan and has become a craze in the United States recently. I want to say (but may be wrong) that “smash books” might have had something to do with it. Smash books are supposed to be a way that someone can scrapbook without worrying about everything looking perfect or artsy. You are essentially supposed to “smash” your memories in to the pages nonchalantly. I have yet to do a smash book, but it is one of those things that I am oddly drawn to. The secret to making sure you are getting a good deal when purchasing Washi Tape is very simple, do the math. I wish I had taken my own advice in the first place. Sometimes I get so excited and want to buy something that I don’t listen to the other part of my brain which is the reasonable half. You will see what I mean below. 1. The Lace Washi that I purchased from WishyWashiTape was a good deal. They have a good selection on their Etsy Shop too. However, their prices vary per roll, so you would need to do the math on each to make sure you’re getting a good deal on all of them. 2 & 3. Drew’s Washi Tape. I found Drew through his youtube channel “cardofmyeye”. He recently put out a video showing that his Etsy shop, Discount Charms, would be carrying Washi Tape now. When I saw one with clocks and another with newspaper ads, I immediately bought them without even thinking about pricing. He has a discount code right now, 10percentoff25, which gives you 10% off purchases over $25. That is why I show pricing both ways on the chart. He has a good selection and consistent pricing so you don’t need to worry about doing the math on each roll. He also has cheap shipping ! 4. Cavallini & Co Washi Tape is beautiful. The set that I got is called “Flora & Fauna”. It included 5 rolls with 16 yards per roll. This tape is a great deal. You have to spend more money upfront though and you have to buy in packs which are all the same theme. They come in a very nice tin too. 5. American Crafts Dear Lizzy Enchanted. I jumped on these right away because I loved the designs that came in this 3 roll pack. Unfortunately, I got ripped off. At $0.46 per foot this tape is not a deal at all. You get 18 yards TOTAL, not per roll. I will be using these sparingly since I don’t plan on buying them again. 6. K & Co. Smash Tape Black & White Polka Dots. This “Washi” tape is actually called Smash Tape, but it shares the same properties as the other Washi Tapes I have. This is the best deal but they only offer this one design. I wish they would make more because this is a great price! Hopefully I have helped you understand the world of Washi a little better. If you have any questions, please let me know!